Burkina is begun at the center with an eyelet pattern reminiscent of cables and is worked outward with dropped stitches and minimal shaping. Lace panel stitch is charted. To fit bust sizes 30(34-38-42-46-50-54)" Shown in size 34"
This garment is designed to be very loose and oversized. 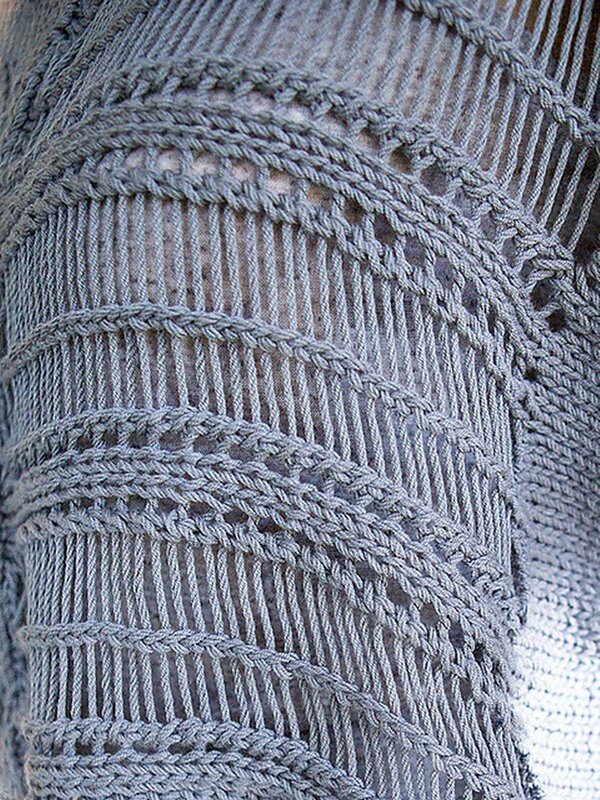 Bust at underarm - 50(52-54-56-58-60-62)"
Universal Yarns Classic Shades Book 2: City Neighborhoods Collection Patterns - Refracted Light Pullover - PDF DOWNLOAD and Shibui Knits FW15 Collection Patterns - Inscribe - PDF DOWNLOAD are both similar patterns: 17 (4.25 sts. / inch) finished gauge, adult pullover garment, for women, and heavy worsted/aran (16-18 sts/4 in) yarn gauge. Hopefully our suggested yarn options for Togo - PDF DOWNLOAD can help you come up with your next exciting new project idea!